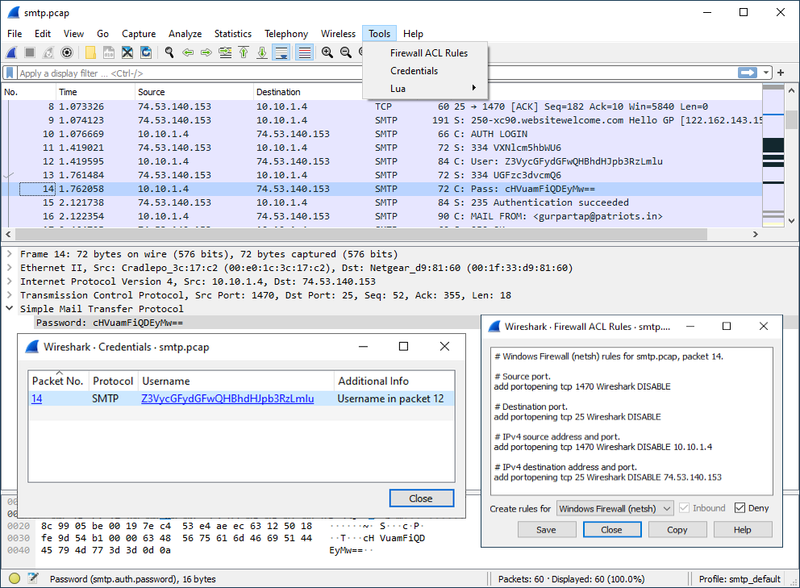 The Wireshark Tools menu contains the fields shown in Table 3.11, “Tools menu items”. This allows you to create command-line ACL rules for many different firewall products, including Cisco IOS, Linux Netfilter (iptables), OpenBSD pf and Windows Firewall (via netsh). Rules for MAC addresses, IPv4 addresses, TCP and UDP ports, and IPv4+port combinations are supported. It is assumed that the rules will be applied to an outside interface. These options allow you to work with the Lua interpreter optionally build into Wireshark. See the “Lua Support in Wireshark” in the Wireshark Developer’s Guide.